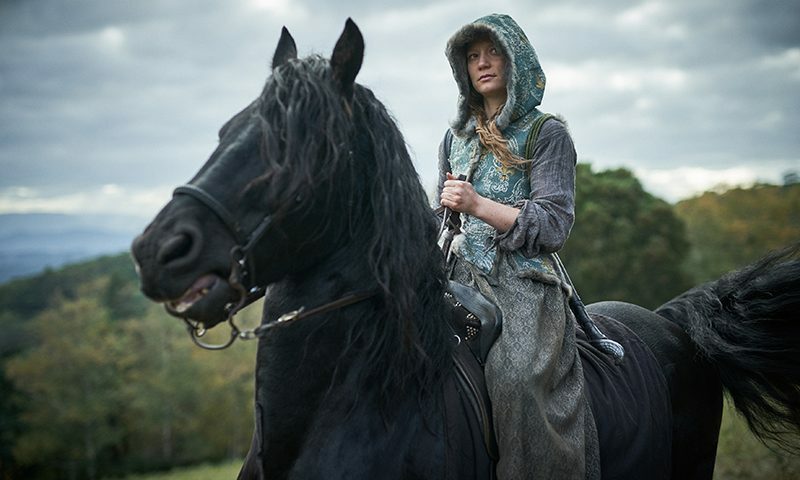 Mia Wasikowska appears in Judy & Punch by Mirrah Foulkes, an official selection of the World Dramatic Cinema Competition the 2019 Sundance Film Festival. Courtesy of Sundance Institute | photo by Ben King. All photos are copyrighted and may be used by press only for the purpose of news or editorial coverage of Sundance Institute programs. Photos must be accompanied by a credit to the photographer and/or 'Courtesy of Sundance Institute.' Unauthorized use, alteration, reproduction or sale of logos and/or photos is strictly prohibited. In 16th century Seaside, a town that is nowhere near the sea, puppeteers Judy (Mia Wasikowska) and her husband Punch (Damon Herriman) are the main source of entertainment. Their puppet shows require synchronized choreography, but Punch seems to be the one taking all the credit and glory for himself. While Punch is more concerned with drinking and debauchery, Judy tends to their infant child and holds their puppet show together. 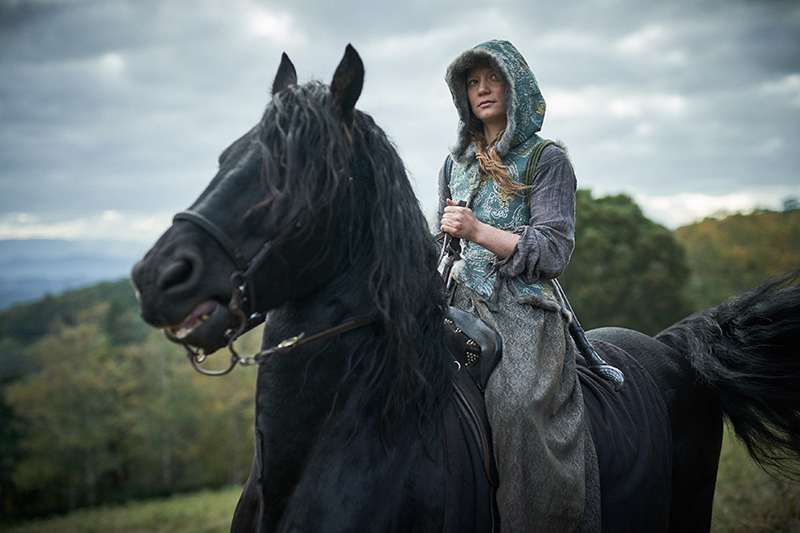 Judy and Punch’s relationship is surrounded by the undertone of swift justice and the ongoing public witch hunt of their town. The new constable, Derrick (Benedict Hardie), wants to push an agenda of rational thinking, but is met with resistance from the town’s vigilante brute squad. He has an obvious soft spot for Judy, and warns her that her magic tricks may be misconstrued by the people in town. When the town rounds up some heretics to be stoned, Punch is asked to throw the first stone, which he does with enthusiam. Judy, disgusted by the whole affair, drops her stone and leaves the scene. The story takes a dark turn, essentially turning the alcoholic, violent Punch against Judy. After being rescued by ostracized heretics in the nearby forest, Judy battles with her internal struggle of wanting to move on from her traumatic experiences with Punch, and going back to punish him for his sins against her. There is an arcane, dark fairy tale aspect to Judy and Punch, starting with Judy’s mysterious abilities and furthered by the magic of the heretics who live in the forest, hiding from the townspeople. For me, I had a difficult time deciphering whether the film was supposed to be more about Judy getting some good, old-fashioned revenge on Punch or about how the town’s collective narrow-mindedness has driven away some of the best and brightest residents. The seemingly nomadic group of heretics living in the forest give off the impression that they move around constantly. However, Judy names off specific heretics who have been chased away by the townsfolk of Seaside, implying that they’ve always just been living on the fringes of Seaside. In the same vein, Derrick initially seems smitten by Judy, but then their relationship is never touched upon again during the film. His motivation completely shifts into wanting truth and justice, while still only vaguely in awe of Judy. That being said, the visual effects of the film were quite pleasing—the town gallows are set on a misty, green overlook to the forest, and the heretic camp is full of exciting color and spellbinding background characters. I wish that the magical element of the film was explored more in depth, especially the heretic camp in the forest. They were presented as fairy-like people who are capable of magic, but at the same time they were also just supposed to be a rag-tag group of the town’s rejects.